A recent article in the January 23, 2012 issue of National Review drew some interesting conclusions from a research paper by Casey B. Mulligan, a University of Chicago economist, about the growth of the social safety net during the ongoing Recession. The interesting part, though, was not in the conclusions themselves, but in how the author of the article misused the data to get there. In his write-up, Hassett states that spending on social programs “increased not only due to the recession, but because the eligibility requirements for most programs were expanded, and their benefits increased. Spending per person has gone up, not just total spending.” This much is true. But throughout the remainder of the article, Hassett carefully bends his words and the data to mislead the reader and conclude that staying home and collecting a government check has never been so attractive. 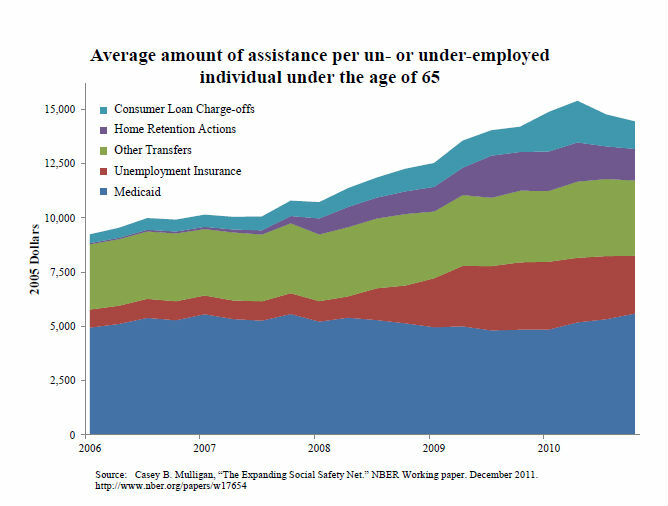 He first refers to the chart below, which shows the average amount of assistance per un- or under-employed individual under the age of 65, from the beginning of 2006 to the end of 2010. Hassett concludes from this chart that the benefit of not working increased sharply over that time, from about $10,000 to $15,000 per year – a 50 percent increase. When we dig deeper, it’s clear that his interpretation of the chart needs careful consideration. Hassett uses aggregate data in order to make his case, but this method masks what is going on beneath the surface of that data. He states that the increase in government assistance shown in the chart was in large part because the average monthly unemployment insurance payment was $834 at the beginning of 2006, while by the end of 2010 it was $2,667. This is a stark increase. What is this data really telling us? There are several factors that could result in an average unemployment benefit increase of that magnitude, but Hassett’s analysis gives us no indication of what happened to the unemployment insurance benefits of any one individual during the recession. For one, an individual’s unemployment benefit is based on his previous earnings. Without any changes to the eligibility requirements or any increases in benefits, we would expect the average benefit to increase by a large percentage if the average displaced worker in 2010 was earning much more than the average displaced worker in 2006. Data from the Bureau of Labor Statistics show that this was, in fact, one reason for the increase in average unemployment benefit highlighted by Hassett. Industries characterized by higher-than-average wage earners, such as “professional and business services,” were hit hard by the recession; therefore, the average unemployment benefit paid out in 2010 was naturally much higher than it was in pre-recession times. Another reason for the increase is that the American Reinvestment and Recovery Act (ARRA) did indeed increase the unemployment benefit for individuals; however, that increase was nothing on the order of the 320% increase Hassett would like us to buy into. In Virginia, unemployment benefits range from $54 per week to $378 per week and equal roughly 50% of the salary earned while employed. The ARRA increased the weekly unemployment benefit by $25 per week and exempted the first $2,400 of unemployment insurance received in 2009 from federal income tax (a change that saved taxpayers an estimated $5-10 per week during that year). Based on these calculations, the lowest wage earners (those getting $54 per week) saw their weekly benefit increase by roughly 55% while the highest wage earners (those getting the maximum $378 per week) saw their benefit increase by roughly 9%, a far cry from the 320% increase Hassett identifies. Another important change that came about from ARRA was that, for unemployed people who participated in COBRA (to extend their employer-provided health insurance plan), the government paid 65% of those health insurance premiums. This does constitute a large increase in the weekly unemployment benefit; this subsidy is estimated to be worth, on average, $184 per week for family coverage under COBRA. The problem arises when Hassett uses this portion of the increase in benefits to argue that staying home and collecting a government check has never been so attractive. Hassett fails to put these numbers into context before drawing his conclusions. Health insurance coverage through COBRA often is a substantial new cost for displaced workers. Unemployment benefits are calculated solely on wages. They do not include the value of employment benefits like health insurance or life insurance. Even with the ARRA COBRA subsidy, many displaced workers paid more for health insurance coverage than they did while employed. New expenses like this one, coupled with an unemployment insurance income far lower than their previous wages, mean displaced workers often have trouble making ends meet. While it’s true that the ARRA COBRA subsidy made unemployment less daunting (its intended purpose) than it was before the ARRA, it is irresponsible to imply that this portion of the benefit makes unemployment an “attractive” option. Policy debates over issues such as unemployment insurance and the effect it has on America’s labor force are important, but productive debates require sound data and unbiased analysis. In his article, Hassett improperly uses aggregate data to paint a picture of displaced workers happily sitting at home counting their piles of government cash. While it is true that the government provided additional help to displaced workers during the recession through ARRA, these additional funds do not justify Hassett’s assertion that staying home and collecting a government check is now more attractive. In reality, many Americans who lost a job during the recession are still struggling to find work, pay the bills, and save for the future. For most Americans, a period of unemployment is hardly a walk in the park, but is often wrought with worry, doubt, and fear, in spite of the help coming in from the government.